Are you familiar with the recent phenomenon of companies creating dedicated social spaces to encourage their employees to interact with one another face-to-face at the office? We take a look at why leading-edge companies — from Google to Hyatt Hotels Corporation — are investing in social spaces, which are designed to build a cohesive workplace culture that encourages spontaneous dialog and helps foster creative collaboration between employees. It Takes a Neighborhood: The Rise of the ‘Third Place’ in Office Environments Where do you like to spend your time when you are not at work? Perhaps you like to hang out and drink coffee at the nearby neighborhood coffeehouse, walk your dog at the park, join members of your faith to worship at your church, or meet your friends at the local pub. In the view of American urban sociologist Ray Oldenburg, these are all examples of a “third place” that exists between our homes (”first place”) and where we work (”second place”). Since Oldenburg published his 1989 book “The Great Good Place: Cafés, Coffee Shops, Bookstores, Bars, Hair Salons and Other Hangouts at the Heart of a Community,” many urban planners have adopted his language to describe the central role that these public spaces play in creating a positive community culture. Commercial interests have taken notice. In fact, Starbucks, as well as McDonald’s, are among the many businesses jockeying to become the de facto “third place” in communities across America. Dedicated social spaces at CEB headquarters in Arlington, Virginia (now a division of the research company Gartner) provide ample space for employees to interact in a public environment that fosters a creative and diverse work culture. Corporate office space planners have taken note as well. If these social spaces help build community outside of work, couldn’t they also be effective for enhancing the performance of culture in a corporate office environment? Intuitively, it makes sense. Where do you get your best ideas? At your desk at work or while sitting at the coffee shop? What about collaboration? Is it better to set up a formal meeting with a colleague to ask a favor or would you prefer to just run into them casually at a restaurant or cafe? Many space planners are starting to think of designing offices to be more like a neighborhood, with different zones for different functions. Most offices already have well-established focus spaces (for getting work done), collaboration spaces (for formal projects and meetings), and learning spaces (for training and education). By adding dedicated social spaces to the mix, you can help build new relationships between employees that can strengthen a company’s overall work culture. 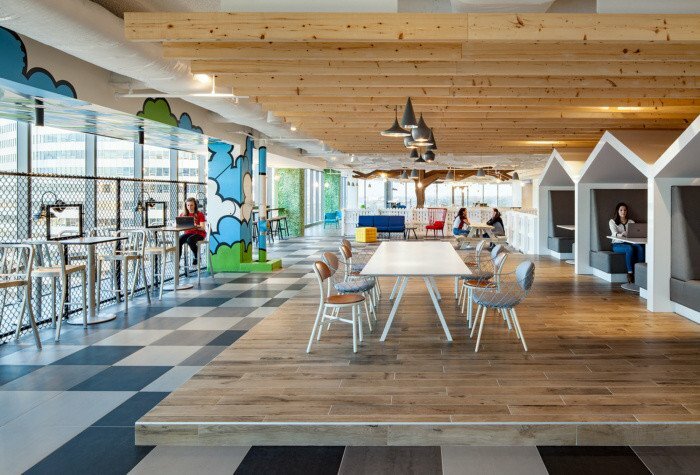 One of the innovators in creating dedicated social spaces at work is Google. In this video (filmed by the Wall Street Journal) of Google’s original office space in New York City’s Chelsea neighborhood, you can see that even within the crowded floor layouts, Google’s office designers were able to carve out casual social spaces with whimsical themes that encourage face-to-face meetings where employees can freely exchange ideas. Social spaces in Google’s original New York City Office at 111 Eighth Avenue location in the Chelsea Neighborhood. What’s Driving the Changes in Today’s Work Culture? There may be a greater need for social spaces within the office than most executive managers realize. As our economy has become more connected, thanks to Internet-based solutions that are steadily integrating nearly every work discipline into one cohesive “machine” — from marketing and sales to product design, to supply chain operations and customer service — it may be ironic, but today’s employees actually have a much greater need to interface face-to-face with other departments across the organization to get things done than ever before. ● Finance Department: Today’s finance teams can track expenditures and make financial forecasts in real-time, but with greater data, comes greater responsibility — for coordinating with all other departments, which, in turn, means the need for more ad-hoc face-time for planning and making strategic decisions for the business. ● Information Technology: Thanks to the digital transformation of the enterprise, practically every job function in every department requires extensive coordination with the IT department. Not to mention that within IT departments themselves, the increasing adoption of open software components that need to work together requires even more human coordination. Remember: not all big decisions or ideas come from meetings. Social spaces can provide spontaneous connections that can help solve critical business problems — both big and small. ● Engineering, Research, and Product Design: These departments can no longer afford to work in an isolated information “silo” as they may have in the past. Fast-moving customer preferences and crowd-sourcing ideas are influencing today’s product development and engineering processes as much as real-time quality control feedback and supply-chain sourcing data. In response, many teams are turning to agile development processes to work more quickly, but the bottom line in space planning terms is that all these changes are driving the need for more face-to-face communication across the enterprise. Many of these same arguments apply to other corporate departments as well, from sales and marketing to quality management, to product support, to supply chain management, distribution and logistics, to employee training and human resources. 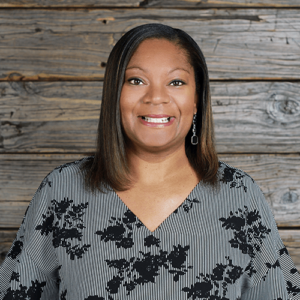 In all of these job functions, the challenge that employees face is how to perform their jobs in a more integrated, more cooperative, more measured, and more instantaneous fashion. Given these pressures, it’s no wonder that workers feel the need for places to meet in person when the conference rooms are all booked up. In a world where more of us work in open offices, we need a place to meet and talk. And finally, it’s not just rank-and-file employees that benefit from having social spaces to meet with their colleagues to exchange ideas. Mid-level managers and senior executives, especially those who ascribe to the servant leadership model, find it very advantageous to meet with employees in a casual social environment, where they can hear directly about issues that might not yet have come to their attention, or to provide assurance and guidance to employees concerned about a particular issue or policy. Like many companies, Hyatt Hotels Corporation was hesitant about investing in social spaces for their new Hyatt Global headquarters in Chicago. What would be the return on investment, they wondered. Call it what you will, it turns out this “justification” was enough to convince Hyatt Hotels Corporation President and CEO Mark Hoplamazian to come on board. In his view, their new Chicago headquarters, which is designed to mimic the experience of visiting a Hyatt hotel property, is the perfect way for Hyatt employees to experience the very type of social interactions they want to create for their hotel guests, especially business travelers. This new Gensler-design headquarters also puts Hyatt in the catbird seat for helping set the direction for what has been one of the hottest trends in office design for the past couple of years — the resimertial look that combines the comforts of home with the casual ambiance of an elegant but relaxing hotel environment. Checklist for Successful Social Space Implementations in the Office Are you ready to create your own social space within your office environment? Here are 8 different aspects to consider when designing a “third place” within your office to encourage employee interaction. 1. Does it encourage creativity? A social space can inspire new ways of thinking, and that’s the point. Create a public space that takes people out of their conventional way of thinking by inspiring them to be playful and interactive. 2. Is the design authentic? As consumers, Millennial and Gen X are famously expert at sussing out what’s genuine and authentic and what’s contrived. Put your best feature forward. A social space with the best view in the office will naturally attract users, while a converted basement room with no light might repel visitors. 3. Is the social space transformative? 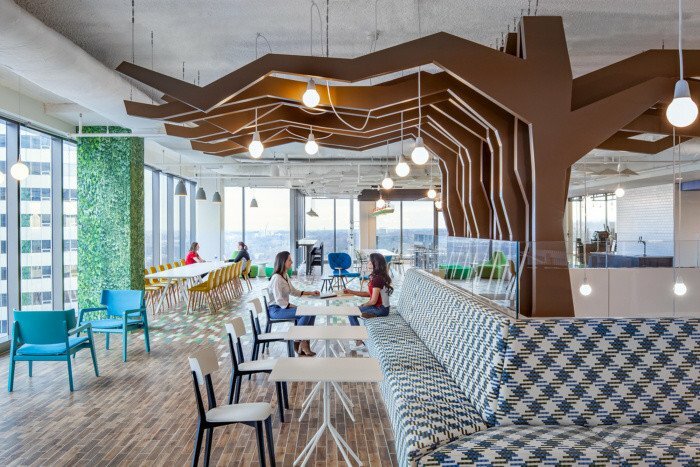 A well-conceived social space can be like a chameleon — transforming from one use to another — from a company-wide party venue to a relaxed play space. 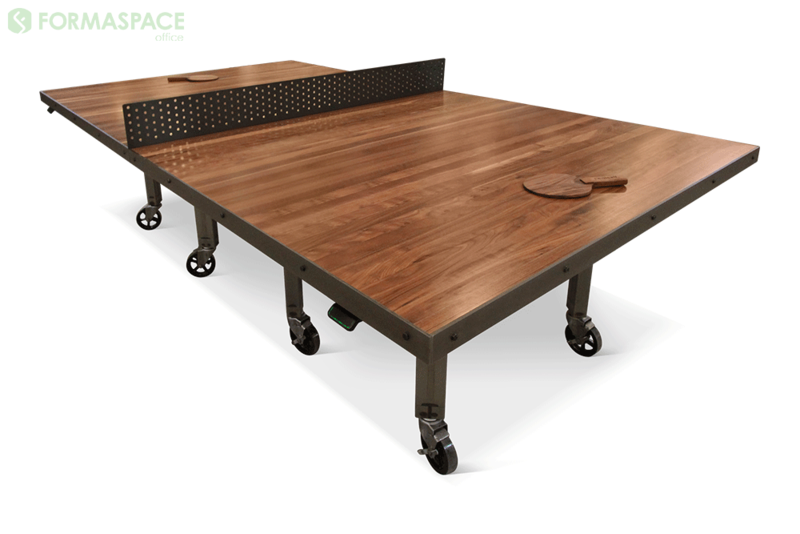 Talk to your Formaspace Office Design Consultant about our flexible furniture concepts, such as our #NETworking table which transforms from a ping pong table to a pair of side tables in seconds. 4. Can you bring the outdoors inside? In our survey of Millennial workers, outdoor access and views scored among the top wish-list amenity items. Consider connecting your social spaces directly to outdoor areas (including providing outdoor wi-fi access) to bring the outdoors inside. 5. Will there be food? We are social creatures who love to gather and eat together. 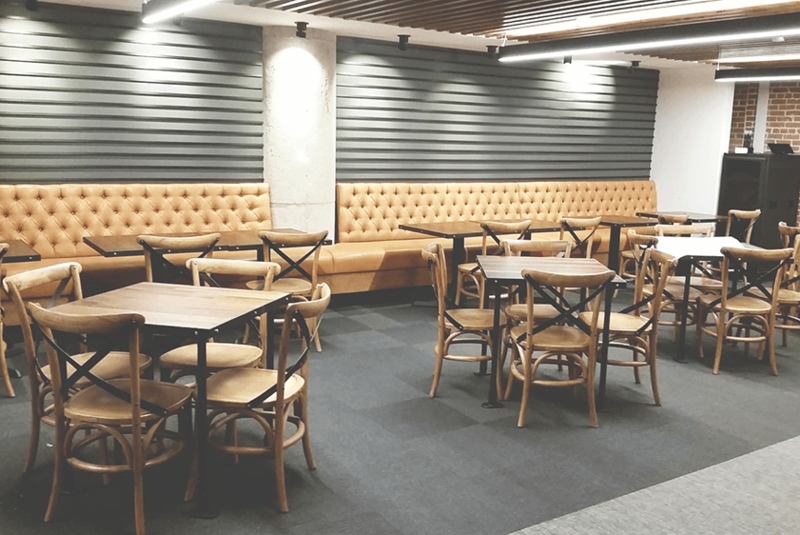 Connect your social space with adjoining food and drink bars, or larger cafeterias, to draw employees together over food and drink on campus (rather than to offsite restaurants and cafes). 6. Does it encourage movement and wellness? Sitting too long at your desk is not healthy. That’s why Formaspace Office creates a unique line of sit-to-stand desks that encourage movement throughout the day. Walking within the office to a social space also encourages healthy movement. Many thoughtfully-designed social spaces can also serve double-duty as areas for yoga classes and other exercise programs as well. 7. Does it connect to other zones within the office? As we mentioned before, the well-designed office floor plan already has zones for Focus, Collaboration, and Learning. Careful placement of social zones can encourage employee use, but also prevent noise from disturbing those employees in other zones. See our report on reducing noise in open-plan offices for more ideas. PS: don’t forget wireless connectivity in the social spaces for those who want to escape their desk areas. 8. Would you want to work here? That’s a good way to judge if your social space can help as a recruiting and retention tool, a critical point to make in a business environment where competition for the best talent is fierce. Formaspace Office is ready to help you create a better work culture. Our innovative, stylish office solutions will help your employees feel better at work and be more productive. And don’t forget: If you can imagine it, we can build it. We can build custom, bespoke office furniture that’s a reflection of your company’s own unique brand. Think of us as your secret weapon in the furniture industry: we are big enough to make custom designs in quantity for you here at our factory headquarters in Austin, Texas, but attentive enough to give you the personal attention that you deserve. Take the next step. Contact your friendly Formaspace Office Design Consultant today to learn how we can help make your next project more successful. The Flexible Office Is the New Trend? What's the Key to Signature Work in Office Design? Should Your Company Embrace Reverse Mentoring?